Investors don’t understand the true worth of their advisors – which leaves the advisors scratching their heads. They keep wondering – Where have I gone wrong? Is it related to Investor Behavior? It is not that as an advisor one may actually be wrong, but there are entrenched thought patterns of clients which make them think that way. The client may not be conscious of this but would be doing it intuitively. We need to understand first where the biases are coming from & what some of those biases are. Only when they understand that, can it be tackled. Most of us are not prescient… we are not expected to be. Hence we would not be able to anticipate which events will happen or how it will unfold. But after the event, it all seems so logical and even cogently explainable. This is irrespective of how improbable they thought the event was, before it occurred. That is why people tend to have the opinion that the event could have been predicted – especially by their advisor! Psychological experiments prove this. Baruch Fischhoff demonstrated this “I knew this all along” effect, through an experiment. Fischhoff conducted a survey on possible outcomes of Richard Nixon’s trip to Russia & China in 1972 and asked people to assign probabilities to various events, before the trip. When the trip was done & he went back to the same people, there were surprises in store. Whichever event had actually occurred, people exaggerated the probability they had assigned to that event. If it did not happen, people said they always felt it would not happen ( though the probability they assigned before that even was higher )! After the event, everything seems so logical & plausible, that we automatically adjust our memory to align with what is now known! Hindsight bias has huge implications for decision makers. For instance, if during a routine surgical intervention an unpredictable accident caused the death of the patient, it will most probably be believed that the doctor did not assess the situation properly & went in for a risky procedure! The benefit of hindsight & knowing the outcome alters how people perceive what the doctor had done! That leads us to another bias called outcome bias. This is equally true for Financial Advisors. Blaming someone for a good decision which worked out badly &iving too little credit for good moves that with hindsight look all too obvious, is outcome bias in action. When outcomes are bad, people would blame the decision makers for not seeing the writing on the wall, inspite of prudent decisions that the person might have made with the information available at the time of the decision. This again is proved in psychological experiments. In case of 9/11 type incidents, the officials concerned seem negligent, even absolutely irresponsible after the event. CIA had intelligence inputs to indicate that Al Qaeda was planning a major attack which went to the National Security Adviser. This was not escalated to the President, which was questioned after the event. It did not go to the President as it was one of the many intelligence inputs that CIA got and this one did not look specifically significant. Predicting outcomes is extremely difficult as there are so many variable affecting an outcome. There is another important area where the clients are prone to judge the advisors, rather incorrectly. Advisors are expected to keep shuffling portfolios or keep doing something, in their quest to advice clients. That is why advisors who tell their clients to just stay invested or tell the clients that no changes are needed in their portfolios, are not that popular. People like action. Those that are constantly seen to be taking action are seen as dynamic & proactive. This is called the action bias. The good advisors who advised clients against unwanted churn are not fully recognised for their wisdom, even if they have got good returns. The client thinks that the markets have done so well that the returns they have got would anyway have come – an outcome bias acting against the advisor. Action bias is seen even in sports. In a penalty kick, there is a penchant for the goalie to jump to the left or right without knowing the intention of the kicker. Had the goalie been standing in the middle, he would have probably saved more goals. That’s what studies suggest! The goalie does not want to be seen as slothful & the viewers equally expect him to dive to the left or right, instead of planting himself in the middle. That is the classic action bias at work! All these biases and many others are fairly well entrenched and people cannot help it. For that reason, financial advisors should expect clients to react in a certain way, in specific situations. This by itself is a useful insight. Knowing this, they should sensitise their clients about such biases & refocus their value proposition to the client. It is best to own up to the clients that prediction of markets, economy’s direction, how well the equities will perform over the next few quarters, where the inflation would be a year from now etc., are questions which cannot really be answered. For one, it is impossible to predict such things & get it right. There are just too many variables which can impact events, today. When one gets it right, it is probably not predictive powers; probably it’s just lady luck smiling benignly ! Clients need someone to anchor them & provide the moorings on finances. They want someone trusted, someone dependable whom they can bank upon… who would provide unwavering support & offer appropriate advice at crucial times in their lives, as per their life situation. Once the clients perceive the value of their advisors beyond returns, most of these biases would not impact the advisors. Advisors first have to understand that they cannot predict the future & their value is in being a trusted confidante to their clients. Many advisors themselves still believe that their powers to predict the future is the way they add value. Now, advisors should know better & reposition themselves and the value proposition that they deliver – which would be good for them & their clients. Last week I met my friend Saurabh who is now a Regional head with one FMCG company and stationed at Bangalore. We were sitting in a coffee shop when suddenly he told me that he’s thinking to engage a financial planner to manage his personal finance matters. This was not a new thing to me as he shared the same thoughts around 3 years back but shocking was that till date he’s still thinking. That time I also gave him few references of my fellow financial planners but he did not contact anyone. I didn’t want to mix my profession in friendship so it was better if he deals with some other good planner, to which he agreed. Now when we were sitting in an easy mood, I got quite curious to know what stopped him to go ahead or what made him think so much? After all, he’s been thinking about this for the last 3 years. Elaborating this further he said, that he went to my references’ website and also called a few, but was not sure if the fee they were asking for was justified to the work or not. Just to avoid the charges he went to Google and tried to learn about financial planning and planners, got huge information which further confused him. During the search he happened to visit few good blogs which he immediately subscribed to. He also found a site which offers financial planning online at very nominal cost. So he went ahead with that and got his plan document made. He implemented few of the advices but many are still pending as some of the bloggers views were different on those recommendations. Actually he tried to confirm the recommendations from them. After sometime he started feeling that investments is an easy job and he don’t need any financial planner. He also shared that he’s afraid of the discipline that financial planning asks for. Getting into a structure might restrict him in his financial independence and also might dilute his control over his own finances. He said how anyone else can take decisions on his behalf related to his personal finances. How would the planner know, what are his aspirations and desires? He said sarcastically. Ok. So now what? I mean what made you search for financial planner again? I asked saurabh. He replied that he was feeling direction less. In the last 3 years, he did have accumulated some investments but was still not sure if those were right choice or not. Different people have different views. Online space is full of information which confuse a lot. Even after having 15 page plan by spending R 2500, he had implemented only 10% of it. One friend’s wife sold him 2 Insurance policies; his banker sold him few mutual funds and keeps coming back with new offers every now and then. His kid is about to start schooling next month and he was worried on his future. Work stress is rising day by day, he felt that the working life span may get reduced with the kind of lifestyle he’s living, this worried him on the retirement and estate planning front too. Hmmm…after listening to him patiently…I asked, so what do you want from me now? He answered with smile – Duvidha door kare prabhu!! Avashya bacha! !…so it was my turn now. I gave you reference of some of the good planners of Industry, but you disregarded them due to the fee they charge. Actually the problem was not fees, it was your understanding of the value behind the fees. You thought fee is for some pages of plan and that too investment plan which is freely available online, then what’s the point in paying 15/20/25 thousand. Right? So the first problem is “lack of understanding”. And the next is that you are human. Humans are emotional beings, full of biases. You can ignore the long term loss to get short term gain. This is what we call as Instant Gratification. Just to avoid few thousands of fee, you wasted your time and money on so many other things. Though I am sure you must have learned many things, but my dear…Information is not knowledge. You are paying heavy indirect charges to your friend’s wife through those insurance policies, you have helped your banker achieving his Job target…but what about your own life’s goals. Who’s taking care of that? They are getting delayed as you are still thinking. Financial planning is a simple thing and human mind doesn’t value simple things. It is a common sense approach. Which all of us feel that we have but actually we don’t. We are happy paying on complex structures like Endowment insurance plans, Close ended mutual funds…also wants to play in derivatives, but when someone say that he can help in making our life simple, we ignore and be doubtful about it. We can’t make ourselves accountable to our own deeds. It is difficult to accept our own mistakes and rather than correcting that mistake we tend to ignore it. Saurabh, keeping things simple is the most difficult task and this is where financial planners come to your rescue. What price can you put on your peace of mind? I am sure planner must not be asking more than that. 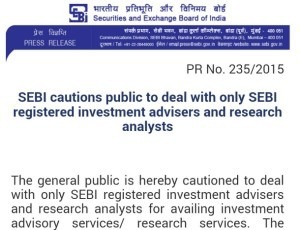 To make the selection of financial planners easy for you, Regulator has started regulating this profession and now if someone is truly doing financial planning then he should first get registered with SEBI and starts calling self “SEBI Registered investment adviser”, by giving clients complete disclosures of the conflicts of interests. Saurabh interrupted and asked…but he will also tell the same things which we can get online and that too for free. Depends on what you get. The “R” which is the difference in FEE and FREE is very important to understand. R is the risk of not acting fully on advice, R is the emotional risk of getting into and sticking with wrong non suitable products, R is risk of getting limited advice which you can take as complete. There’s nothing free in this world. You are paying for everything, directly or Indirectly. See the important thing to remember is that if you need someone’s help, it’s not because that someone is smarter than you, but because that person is not you. To make good financial decisions you have to take “I” out of your investments. I don’t know what you have, but what I know now is that you are getting emotional towards your investments as you have selected those yourself or invested through a close friend. But, are those suitable to your goals or risk profile, would be known when you fix upon some goals, and things get looked upon holistically. Frankly speaking if you don’t have goals you are in wrong investments. No matter how smart you are …you still are human. Emotions overtake you in making important decisions and this is where you need help of outside expert. If a structured approach in personal finance scares you, than just look at what you are doing in your Job. You have your own goal sheet, your juniors have goal sheet, you have your targets to achieve and work full year towards those to have a good appraisal and salary hike next year. Why can’t you follow that disciplined structure in your personal financial life. Company structure doesn’t let you work on your own, it has set processes, protocols to follow and this is how they control the human mind and get the desired results. Same way a written financial plan will bind you with a structure and financial planner will handhold you through out the journey. You will gain success only when you come out of your comfort zone. You have to understand that you don’t hire anyone to make decisions for you but to help you in decision making and keeps check and balance on your decisions. If you can value the worth behind the advice and relationship of planners, they actually charge peanuts. They stand between you and your big mistakes. Financially speaking I have seen people losing big when they are not focused, when they buy products without understanding their overall needs, but structured financial planning saves you from that. Moreover if you think Planners’ charge heavily then do check out the total expenses you pay in your invested portfolio, and add up the cost of the mistakes you’ve made and opportunity cost of the time that you’ve spent. How easy and cost effective it is to fall for the pitches made by stock brokers, Insurance agents and others who have vested interest in selling their product, but when someone asks you about your goals, you look at him with suspicion. And My dear friend, if Fee is the only reason and all other reasons came out to justify it, then you would be shocked to know that when you were thinking, others were working and in these 3 years good planners have raised their fee structure. But no worries your income has also increased during this time …no? Financial planners help in choosing the best suitable products as per your requirements. Now since financial planning is being regulated by SEBI, so you need not to worry from the mis selling front too. At least for now as the number of registered advisers are very few and Regulator is very strict in its guidelines. Electronic media is there to create sensation which is not good for decision making. Bloggers’ replies on blogs should not be taken as advice as every person’s situation is unique and so is yours. Contact the speaker on TV or the blogger directly, and ask if they provide personalized services too and if you like them go ahead and stick to their advice. Financial planning is not only about making investments, its about being comfortable with money matters. Looking things holistically you will know what is good and what is bad for you and how to manage money matters during unexpected life transitions. So don’t waste time on thinking…and start doing. It’s high time. I am sure the hitch is only in the start and you will enjoy the process and the results. Finally he looked satisfied with my answers… and immediately fixed up meeting with one of the planner. What about you all? Are you guys also thinking still…C’mon.